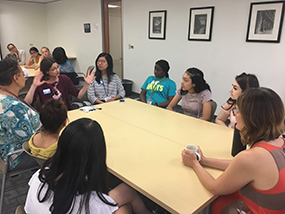 For the third year in a row, it was our pleasure to host the Oregon Summer Transportation Institute (OSTI) at Portland State University (PSU), a free two-week residential camp open to high school girls. This past July, our camp, introduced twenty-three Oregonians to the transportation profession. The end goal? Our hope is to build an awareness in young women of transportation careers and inspire them to pursue areas of STEM study not traditionally open to them. Made possible with support from the Oregon Department of Transportation (ODOT), this free camp was led by Lisa Patterson, the Technology Transfer and Workforce Development Program Manager for PSU’s Transportation Research and Education Center (TREC). The camp featured guest lectures by local professional women from ODOT, PSU, TREC, the Portland Bureau of Transportation (PBOT), , TriMet, moovel, Roosevelt High School, eBay, Multnomah County, Toole Design Group, Alta Planning + Design, DKS Associates, Jarrett Walker + Associates, and Nelson\Nygaard. See photos from this year’s camp. Learn more about this research by viewing the two-page summary from Forth (PDF), and the Final Report on the Project Overview page. This article was authored by Zach Henkin in May 2018 and cross-posted from Forth– a nonprofit that advances electric, smart and shared transportation in the Pacific Northwest and beyond. This article was authored by Kurt Bedell of Portland State University Media and Public Relations, and cross-posted from Portland State University News. Portland State University students may now ride Portland’s iconic bright orange BIKETOWN bikes for free. Thanks to a new agreement between PSU and BIKETOWN, Portland’s bike share program, current Portland State students may now ride any available BIKETOWN bike up to 90-minutes per day at no cost by signing up for a student membership online. BIKETOWN is Portland’s city-owned bike share program, which provides 1,000 shared bikes at over 100 stations across downtown and several neighborhoods. The PSU campus is now considered a Super Hub Zone, which means that BIKETOWN bikes may be parked in any public bike rack on the PSU campus without penalty. Previously BIKETOWN bikes could only be parked and locked in BIKETOWN stations and other designated areas or riders would incur a $2 penalty. On Sunday, July 1, blindfolded Portland State University (PSU) students were seated in wheelchairs, struggling not to drop their long white canes while using both hands to roll between obstacles. Taking turns under simulated low-vision and mobility conditions, they attempted to follow the spoken instructions of orientation and mobility instructor Scott Crawford. Many of these PSU students hope to one day have a job like his. Crawford has over 27 years teaching experience working with Blind and Low Vision individuals. He travels around the United States giving hands-on lessons in orientation and mobility, and PSU Assistant Professor Amy Parker was excited to host him as a guest lecturer at TriMet's indoor Transit Mobility Center in Northwest Portland. In addition to teaching, Parker is the coordinator of PSU’s new Orientation and Mobility Program under the Graduate School of Education (GSE) and her students are learning to be O&M specialists. Unaccustomed to navigating in wheelchairs, much less blindfolds, the students learned invaluable lessons as they fumbled, took wrong turns and bumped into guard rails. See photos from the event. The National Institute for Transportation & Communities (NITC) research consortium, led by Portland State University, has awarded $926,000 in total funding for eleven research projects spanning five universities. The General Research grant is NITC's flagship grant. Annually, we fund general research through a competitive, peer-reviewed RFP process for projects ($30,000 - $150,000) consistent with our theme of improving the mobility of people and goods to build strong communities. Learn more about this research by viewing the Curriculum Module and the full Final Report on the Project Overview page. We’ve got a new curriculum guidebook for undergraduate and graduate students in transportation: a comprehensive set of class exercises to learn pedestrian observation and data collection strategies. Addressing the challenges of an evolving transportation industry means embracing the study of non-motorized travel and preparing the new workforce for it. Funded by our university research consortium National Institute for Transportation and Communities (NITC), this guidebook was designed to enable instructors with little or no experience to integrate pedestrian-related curriculum into their teaching. While accessibility is a key feature, the guidebook combines both new and existing resources into one comprehensive set of learning modules for more experienced instructors. Learn more about this research by viewing the Executive Summaries, related presentations, and the full Final Report on each Project Overview page. Sirisha Kothuri, a Portland State University research associate, has recently completed two distinct studies taking different approaches to advancing bicycle safety. Kothuri will lead a Sept. 13 workshop on Bicycle/Pedestrian Focused Signal Timing Strategies along with Peter Koonce, the division manager of Signals & Street Lighting for the City of Portland. The half-day workshop will be part of Transportation and Communities 2018, a two-day intensive training event for transportation professionals. Learn more about this research by viewing related publications on the Project Overview page. Quickly regaining use of a city's transportation system after a major disaster is critical to relief efforts. To help cities recover from emergency situations, TREC is working to develop a transportation recovery plan that includes transit, travel demand management (TDM), social media, and intelligent technologies.